For all those who’ve been eagerly anticipating the release of our new eBook, it’s finally here! And, just in time for the release of Penguin 2.0. Earlier this year, Bernadette Coleman wrote on the importance of Author Rank and Authorship, and in the wake of new algorithm updates, we decided to delve even further into the issue and give small businesses the opportunity to add a little extra quality and credibility to their site and, more importantly, their content. In this eBook, we provide a step by step guide to learn what Google Authorship and Google Publisher are, how they affect search rankings, and what businesses can do about it. 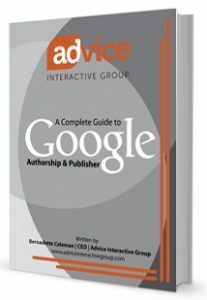 To download a FREE copy of our exclusive new eBook, “A Complete Guide to Google Authorship and Publisher,” simply click here, and enjoy! Check out our eBooks library to read more from Advice.